I was a fastidious child. I was the kid from Louisiana that couldn’t stand seafood, loved macaroni and cheese and chocolate milk for all occasions, and couldn’t stand the sight of meat sauce. But my mother was and is a very wise woman. She knew I wouldn’t eat meat sauce, but meatballs? Of course! My mother understood my weird palate. She knew I was a texture enthusiast and a romantic. 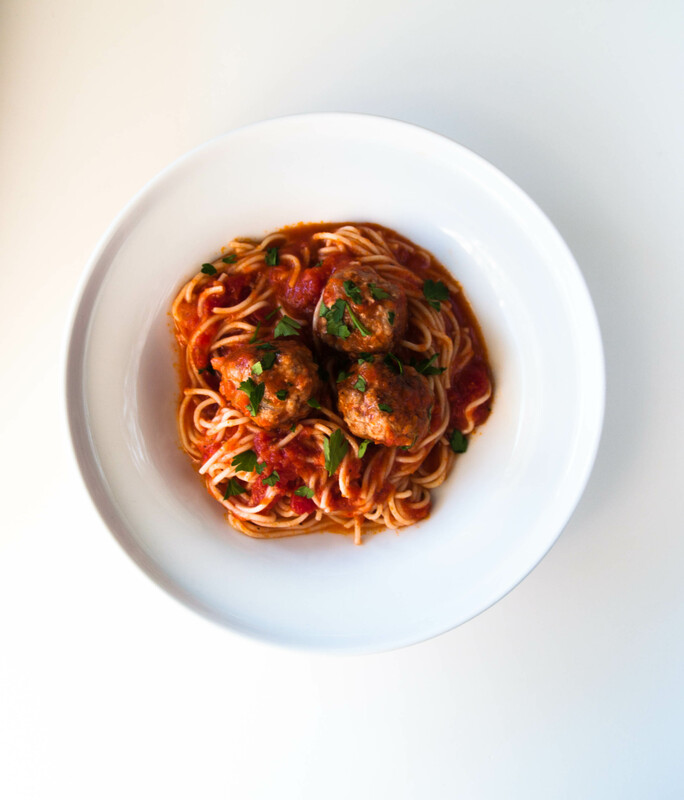 When I say I was a romantic, she knew that I would associate spaghetti and meatballs with Disney’s Lady and the Tramp (the funny thing is I still do!). The scene of two puppies sharing a plate of spaghetti and meatballs with an Italian man in the background singing “Belle Note” was enough for me to appreciate and devour any spaghetti and meatball dish in front of me. And I can only imagine my mom patting herself of the back while the song played in my head and I swayed along, eating my spaghetti until it was all gone. Happy plate! In a medium sized saucepan, heat a tablespoon of olive oil on medium low heat. Let garlic and red pepper shimmy in the oil for 30 seconds. Add the crushed tomatoes, sugar, salt and pepper to taste. Let cook for about 5 minutes then lower the heat and add stock and basil. Let simmer for at least 30 minutes. Add butter and cheese. Adjust seasonings if needed. Reserve for meatballs. Heat a few tablespoons of oil over a medium flame. Sauté onions, garlic, parsley and red pepper flakes together until soft. Season slightly with salt and pepper. Let cool. While the vegetables cool, soak the bread in the milk while you get the meatball mixture prepared. In a large bowl, combine the beef and pork together slightly. Add the egg, cheese, salt and pepper to the meat. Finally, squeeze all of the excess milk from the bread and place it with the meat mixture, along with the cooled vegetables. Mix all of the ingredients together with your hands until well combined. Shape into meatballs. You can shape them into large meatballs or bite-sized depending on your preference. Heat a sauté skillet over medium heat with a tablespoon of olive oil. Sauté meatballs quickly on all sides. I do this step in 2 batches. Once browned, transfer to simmering red sauce for at least 30 minutes. Toss in the angel hair pasta and mix together.